Cool enough to be Copied!! 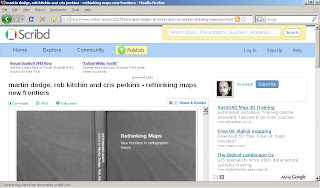 Just been told by Rob that our edited book Rethinking Maps has been pirated and the whole content is currently free online. Its interesting how its become feasible with cheap scanners and pdf software to copy whole books very quickly and widely distribute them online. More details on the book are given on the publishers page and if you're very keen you can actually BUY a copy! A web version of our exhibition has been created on the Rylands Library site. It is a useful addition and contains a number of maps and plans from the exhibition as pdf downloads. 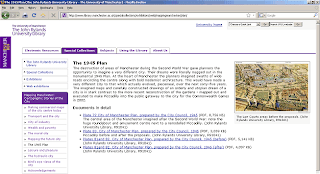 The plans and photographs from the 1945 City of Manchester Plan are really interesting. It can also be consulted alongside the e-catalogue which contains more images and a full list of items in the exhibition. The physical exhibition in the Rylands Library on Deansgate runs for another couple of months, until next January 17th.